This fifteen foot tall Greek Bay Tree is in full flower. The little cream colored flowers don't make much of a display but the evergreen, heavenly fragrant foliage makes up for that. Evergreen, sturdy and fragrant; surely these were contributing factors to the greatness bestowed on Greek Bay throughout history. David assigned the virtue of prosperity to the tree. This meaning has transferred itself to our present society with the conferring of a BA degree or a Baccalaureate degree. Even though we no longer value Bay as a headdress or as a symbol, the spicy aroma and pungent flavor has us clamoring for this unique tree. In the Mediterranean Greek Bay may grow 40 or 50 feet tall, but here it takes a very long time to reach even 20 feet. Because it is slow growing, it makes an excellent container plant. Leave the pot outside during summer and bring it inside for the winter in Zones 2-7. In Zone 8 (which is at the low end of cold tolerance for this plant), it is best to let it assume its natural bushy growth habit rather than trying to train it to a singular trunk like a tree. The extra shrubby side suckers act like a blanket around the center stem and gives it an extra bit of winter protection. The only bays we have lost here in Zone 8 were trimmed up like trees and it was our coldest winter on record at 5 degrees. On the other hand, in the same winter, our small shrubs that were protected by walls o' water survived. That was in 1990 and those same small shrubs are now 10 to 12 feet tall and three feet in diameter. The first several years they were tip pruned often. In 1998, the temperature reached 12 degrees and although there was some damage to two of our 8 Bay trees, none died. In January 2002, just as the Bays were beginning to form buds a record snow of four inches flattened our Bays. Four inches may not seem like a lot, but to bushes and shrubs that are used to 60 or 70 degree days and moderate nights, those four inches were like forty. By mid afternoon the next day, the snow was gone from the shrubs but not from the ground, and the Bay Trees had returned to their upright position. The small, tight buds of future Greek Bay flowers are highly fragrant and overflowing with flavor. They are prized by some cooks for use with venison. They need to be used sparingly because the oils are very concentrated. When the flower buds open, they will will reveal tiny cream colored flowers (see photo above) that will make bluish black berries. These berries will be followed by a flush of new growth, which will produce soft, bright green leaves on the tip of each branch. It is nature's perfect timing that the new growth appears early in the season. Later on, with the coming of summer's harsh sun, this new growth is easily burnt. 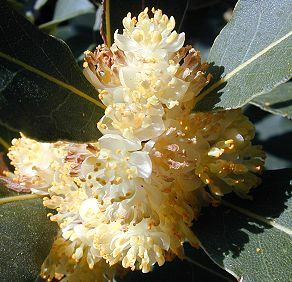 If you receive a Bay Tree in the summer and it has fairly new leaves, it is wise to protect the plant from hot afternoon sun until the plant has become established. 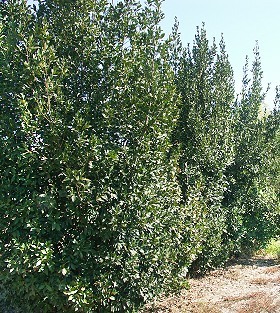 This can take up to a year because Bay Trees are slow growing at first. It is Bay's unique flavor that most of us grow Bay for. It is an essential ingredient in bouquet garni. Combined with Thyme and Parsley in a cheesecloth bag, this seasoning is good for soups, stews and sauces. It also makes an excellent addition to marinades. 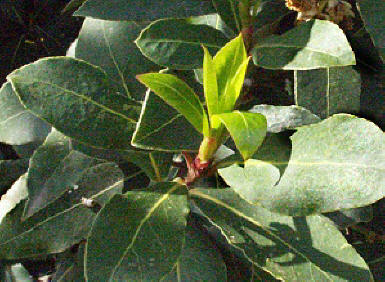 Bay leaves should always be removed from the dish before serving. They can be used fresh or dried. 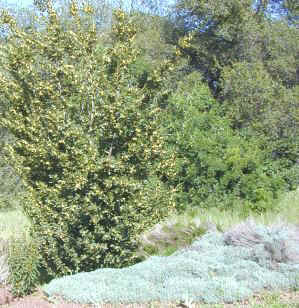 Both the leaves and the berries of Bay have been used medicinally and the oil is used in cosmetics. The Encyclopedia of Medicinal Plants covers the current medicinal use of Bay. Bay certainly keeps fragrant company. Other members of the Lauraceae family include Sassafras (Sassafras albidum), Spicebush (Lindera benzoin), Camphor (Cinnamomum camphora) and Cinnamon (Cinnamomum verum). Avocados (Persea) are also members of this family. In fact, Persea borbonia, commonly refered to as Red Bay, has similarly flavored leaves to Greek Bay. Other plants with the name Bay that aren't this bay are California Bay, also known as Mountain Laurel, (Umbellularia californica) and the Bay Rum Tree (Pimenta racemosa).There is even a very exotic Indonesian Bay, (Eugenia polyantha) California Bay is sometimes touted as a substitute for Greek Bay, but can cause allergies and headaches. According to Purdue University the essential oil in California Bay, contains at least two constituents of concern. The first is Umbellulone, which is a mucous irritant. The second is Safrole which has carcinogenic and hallucinogenic activity. In California, even the deer stay away from California Bay. Bay Rum Tree is the source of oil of Bay that is used to make that classic scent for men's cologne Bay Rum. Greek Bay is one of the six plants chosen to be in our Biblical Herb Garden. At his death in 1910, at the request of his family, a Bay Wreath was the only adornment for Mark Twain's coffin. Gathered on the hill behind his home in Connecticut, it was probably not Bay Laurel. But, the symbolism remains the same. Pruning to a small standard or one of the other topiary shapes offers leaves within reach and fragrant herbal centerpieces. Visit Growing Herbs Indoors for more tips on helping Herbs thrive indoors. It is well worth the extra effort it may take to have this fragrant, gourmet shrub contributing to our herb gardens, and our kitchen tables. This plant is often available in plug trays. These trays hold 128 of all the same plant. They are a great low cost way to fill a lot of space. Each cell is 3/4 of inch by an inch. Check here to see if Greek Bay Plug Traysare available.